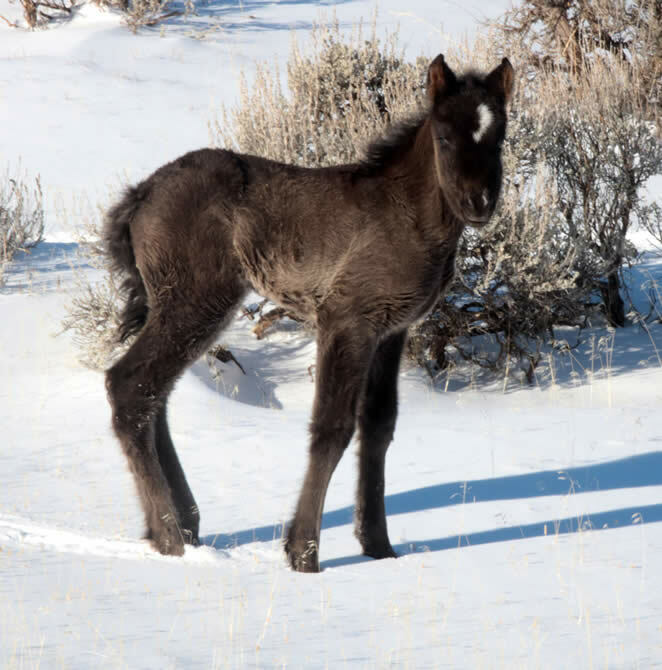 201801 Sorcerer M Morgana Johnston 2/8/18 The first 2018 foal was reported by Bill Pickett of the National Park Service. The name was chosen to continue on with the Arthurian legend to honor dam, Morgana, and grandsire, Merlin. 201802 Sundance M Nova Hickok 4/418 We had been awaiting the arrival of Nova and Hickok’s foal. Kristen Collett let us know on April 4 that it had happened! The foal may have been born as early as April 1. He was named in honor of both parents with Nova’s link to stars and Hickok’s link to the Old West with the infamous Butch Cassidy and the Sundance Kid. 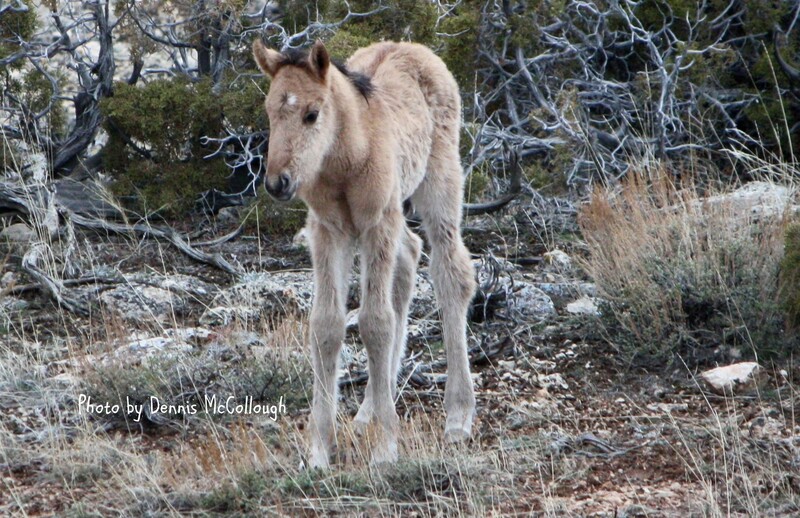 201803 Shoshone M Moenkopi Cappuccino 4/6/18 Dennis McCollough sent a message about Moenkopi’s new dun foal. The colt was named to carry on his grandsire, Jackson’s, legacy representing Wyoming place names. The name, Shoshone, is used for several Wyoming places in honor of the Eastern Shoshone people. 201804 Sentinel M Penn Jesse James 4/15/18 Jesse James and his mares, Cecelia and Penn, are perhaps the most elusive band in the Pryors. So it was a thrill for Nancy Cerroni to find, not only the band, but a new foal with Penn. 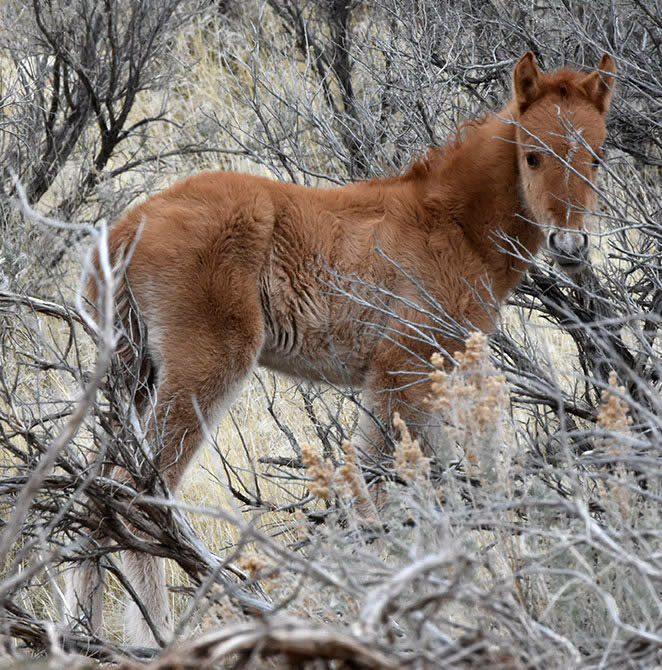 This is a genetically important foal as it connects the Forest Service horses and the Dryhead horses. The colt was named Sentinel mainly in honor of Jesse’s sire, Admiral, and brother, Kapitan. In addition, the name represents the other family members who were named to honor the Spanish and Native American influences on the herd. 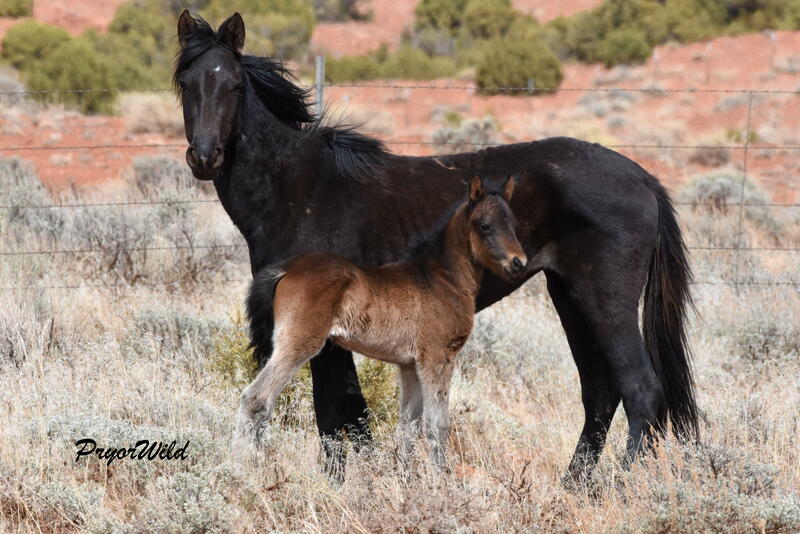 201805 Sparrow M Pele Irial Born: 5/16/18 Deceased: 5/2018 Sparrow lived a short life on the Pryor Mountains. He was first reported on May 16 by Kristen Collett. By May 20 he had disappeared with no explanation. Sparrow was named to honor his grandsire, The Raven. 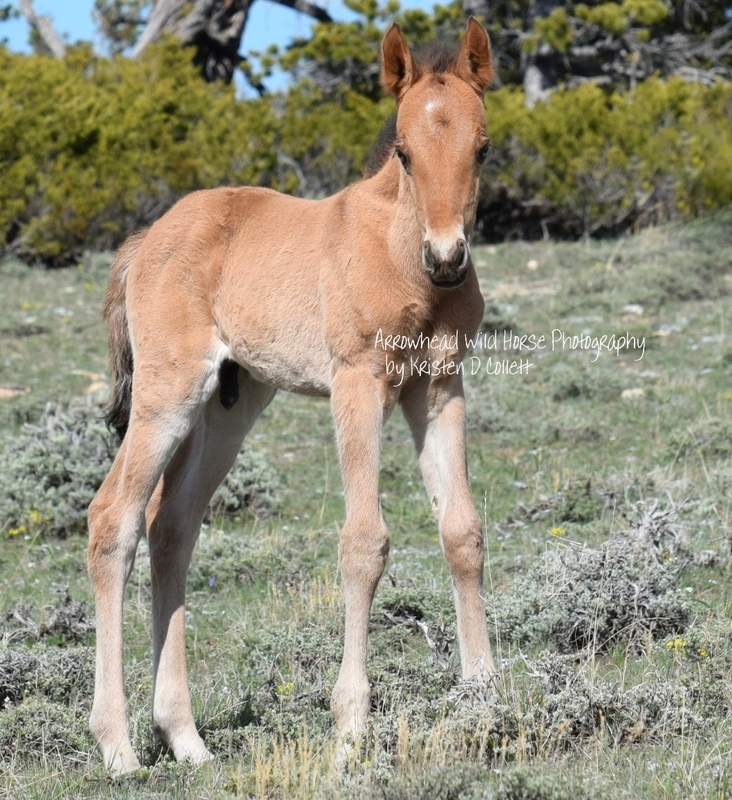 201806 Shamrock F Pegasus Missoula Born: 5/20/18 Deceased: 6/19/18 Shamrock was a lovely palomino filly who added a bright spot on the mountain. She was named to carry on her grandmother, Ireland’s, legacy. Unfortunately little Shamrock disappeared about a month after her birth. 201808 Stargazer M Quintana Mescalero Born: 6/3/18 Deceased: 6/6/18 Stargazer was named in honor of his grandsire, Starman. The colt was a classic grullo Pryor horse. He died just a few days after his birth. 201809 Stillwater M La Nina Hidatsa 6/24/18 The birth of La Nina’s foal was long awaited! The little one was first reported by Christie Marcus who headed out almost everyday to wait for the arrival. The name Stillwater goes along well with her mother and brother, Pax’s name. The foal looks to be a red dun with the looks of his paternal great grandsire, Sir Lancelot. 201810 Santiago M LaBrava Irial Born: 7/13/18 Deceased 7/18/18 Named for the main characters in two literary giants, The Old Man & the Sea and The Alchemist, this little one lived a short life on the Pryors. 201811 Sirius M Feldspar Mescalero 8/23/18 Sirius is the brightest star in Earth’s nighttime sky. This is an appropriate name for this foal as he is definitely a bright “star” in the Pryors. The name fits well as he carries on the blaze-faced legacy of his grandsire, Starman.